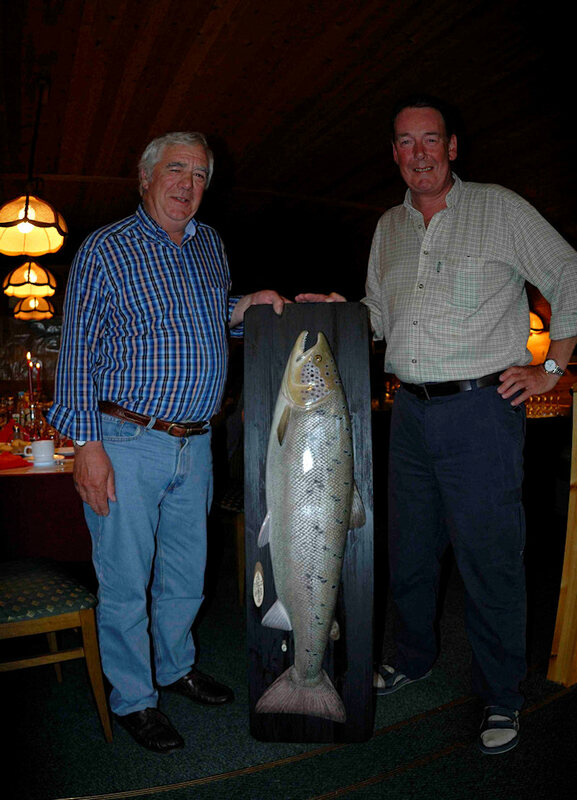 We are delighted to announce the ASR has ended its 11th season with an all time record catch of 4014 salmon. After the unique cold late start the numbers starting picking up from the first of the Summer weeks – and we never looked back! For the season as a whole we were 24% up on 2007. The total number of fish caught in the last 10 weeks was 46% above our 5 year average and 27% for all 16 weeks. The best five great salmon were 47, 41, 37, 35 & 35 lbs. 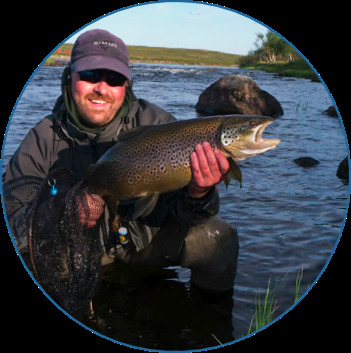 Justin has joined Ruth and me at the Eynsham Office as Director of Fishing. We truly appreciate the magnificent initial response to the invitations and proposals Ruth sent out last week on my behalf. For those of you with no email you should find a letter in the post by next Monday. Many of you have been kind enough to note our economic concerns and compliment us on the Tundra Adventure Program as a low cost alternative to the traditional high use helicopter programs. Thank you also for so many helpful suggestions. As a result of the huge interest in these programs we have decided to introduce them on all four ASR Rivers for four weeks starting 8-Aug-09: Weeks 33, 34, 35 & 36. 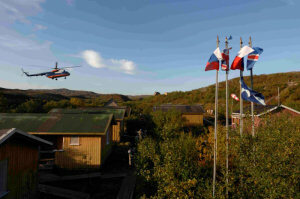 The remaining two weeks starting 5-Sep-09: Weeks 37 & 38 will resume as the traditional high use helicopter program. 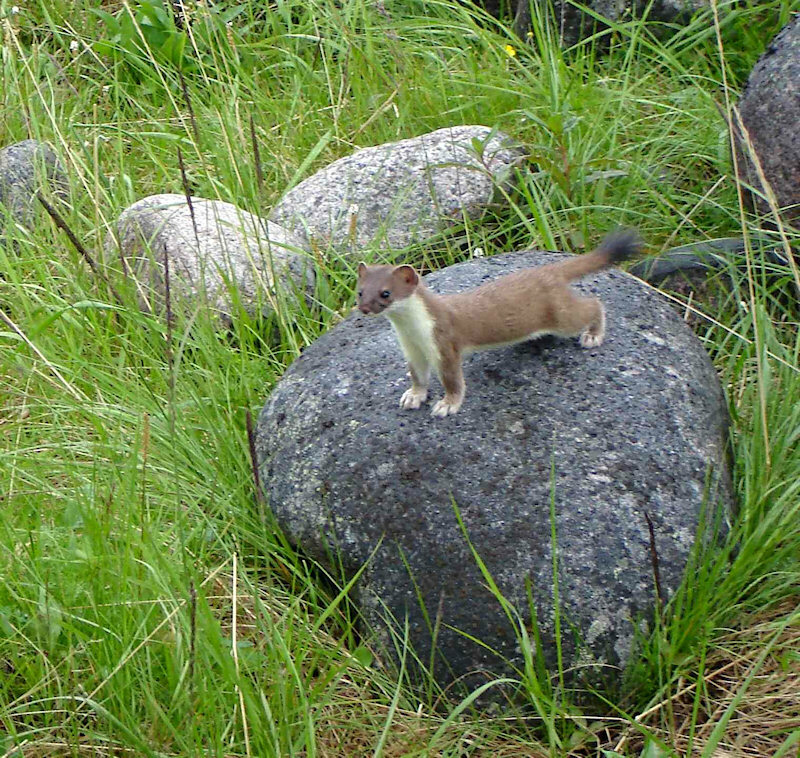 Full details and prices are now published under -Tundra Adventures- in the front page directory of this website. Both Justin and I wish to thank all our wonderful friends, supporters and staff for an amazing season and hope to see you again in 2009. The Kharlovka Report: Week 37 Ending Friday, 12-Sept-08. 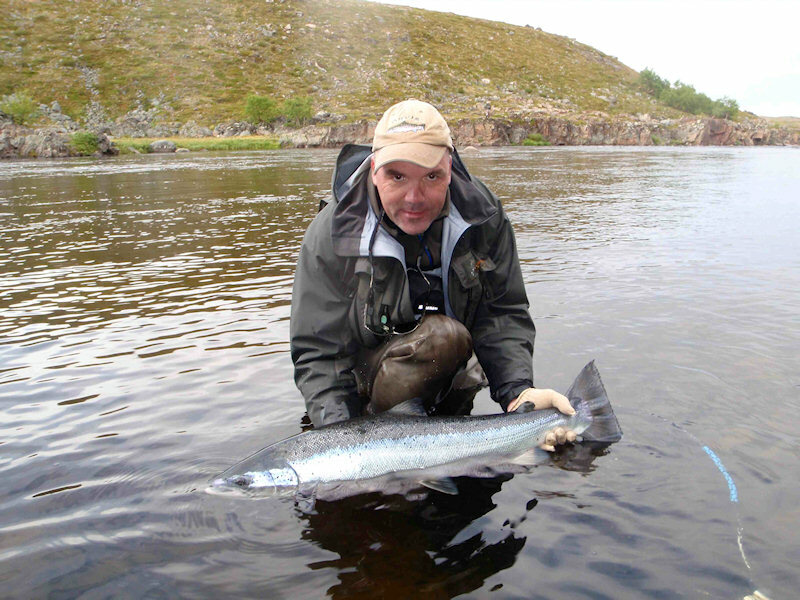 While it is certainly true that the Arctic conditions here along the northern coast of the Kola Penisula normally provide us with a challenge, our final few days of the season proved to be far too bright for the big numbers. Beautiful sunny days were followed on by cold crisp nights. 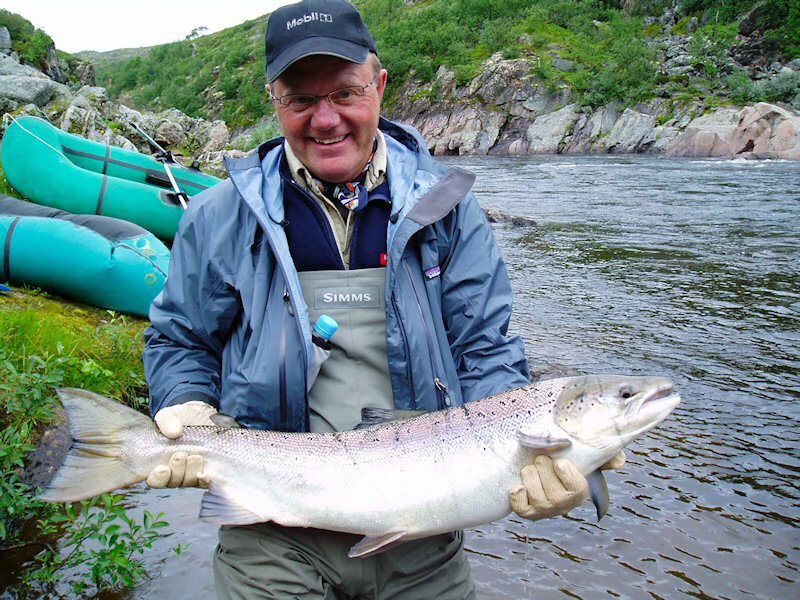 Normally our rivers begin to recognize the autumn season a couple of weeks earlier as the water cools down into the single digits drawing in the Osenkas as well as exciting the well-rested large spring salmon. 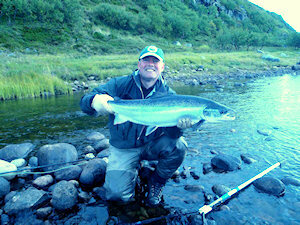 In between all the clear blue skies and their difficult to explain rosy cheeks there was also plenty of salmon joy. Big Watty came close to beating his P.B. 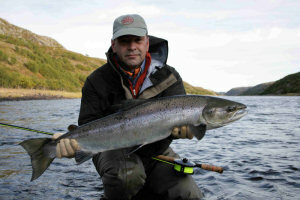 from last season with a memorable 23 pounder from the Upper Tent pool. 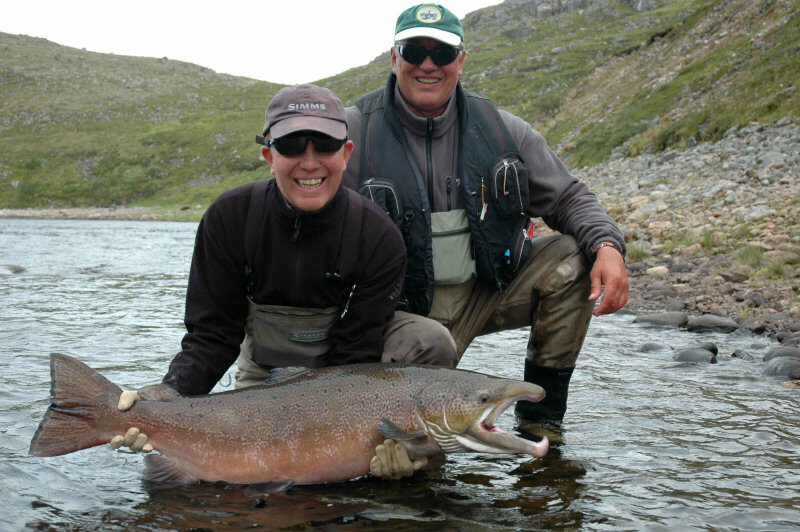 While Ingo will now have to return next year for another go around with the monster he lost out of the Snowbank, Allan will be flying home with memories of his 28-pounder from the Military pool. And then there was our new friend Gordon who is most likely still going on about his new P.B. 23-pounder that he found in the Tent pool. Although Scotland might have got the best of Iceland in the last World Cup qualifying match, Jamie’s Litza 22-pounder was trumped by Elvis who added his Litza 21-pounder and silver Kharlovka 26 to the fishing book. And finally, Vladimir, who was back on his third visit to the ASR this season at his request found himself in trout paradise. Although he seemed to have lost count after chasing down the first dozen on dry fly, we figure he ended up with somewhere around 17 Brownies of between 2-4 lbs after our unforgettable 5 km walk across the spectacular autumn tundra. 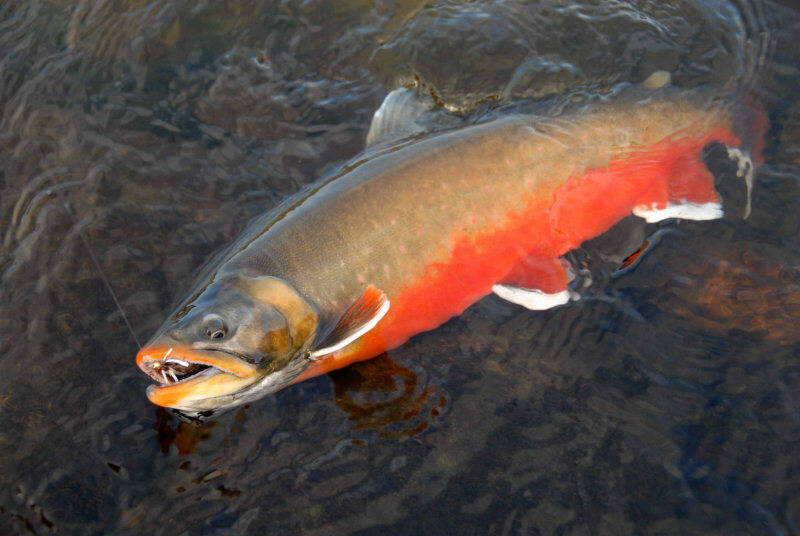 For now it is time for us to dip our hats in the rivers and thank them for their glory, respectfully stepping away leaving the salmon in peace to do their thing for another year. 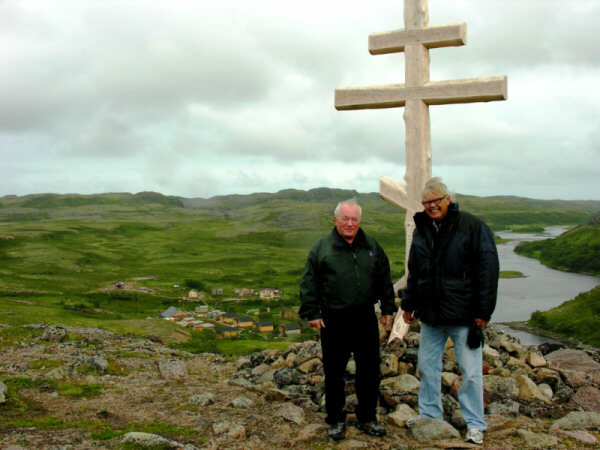 The Kharlovka – Upper Rynda Report: Week 36 Ending Friday, 5-Sept-08. 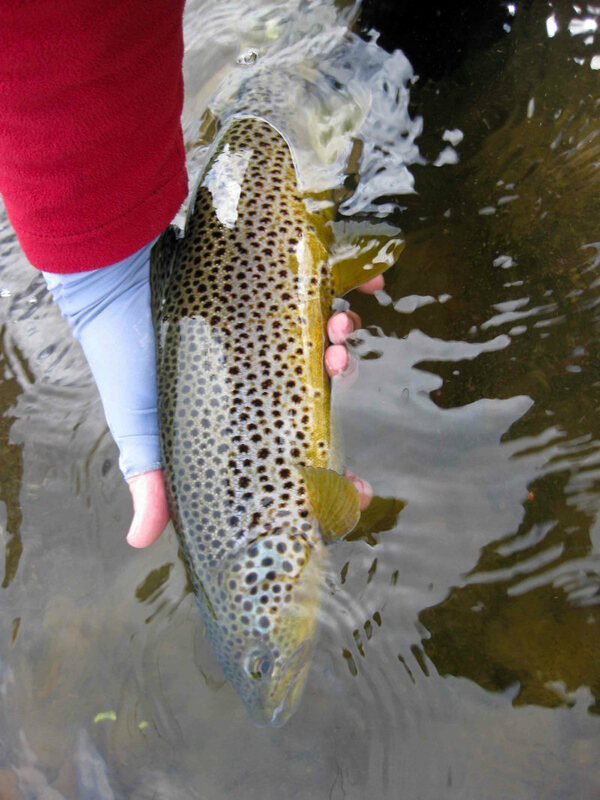 While it may be true that the great salmon prefer those dark cloudy autumn days, last week we received far more than we had bargained for with the rivers rising through the week. At the start of the week we even had freezing rains and brief periods of wet snow. 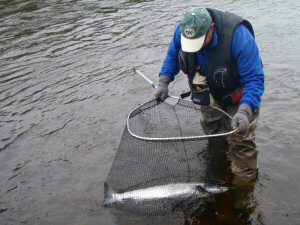 As the rivers surged the river temps went from 10.5 degrees C down to 5.9C in only 48 hours. 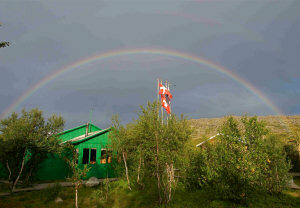 By the Wednesday, unpredictable winds began to gather strength. Gusting and swirling from all directions for the final couple of days, the good news was that by late week the air temps had risen back up into the comfortable low teens. Despite these challenging conditions our intrepid guests must be congratulated for keeping the big numbers rolling in all through the week. 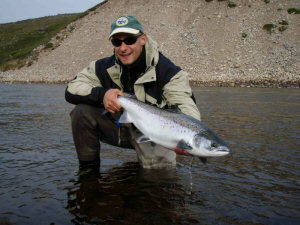 In fact, by the time we got them all rounded up – settled down and dried out they had landed 194 salmon from the Kharlovka and the Upper Rynda. Meanwhile Peter was gave over the Lower Rynda as fly fishing school for local young Russians and they produced a further 47 (See: Life at Rynda) so that the ASR rivers beat their five year average for the ninth week in succession with 241 salmon. 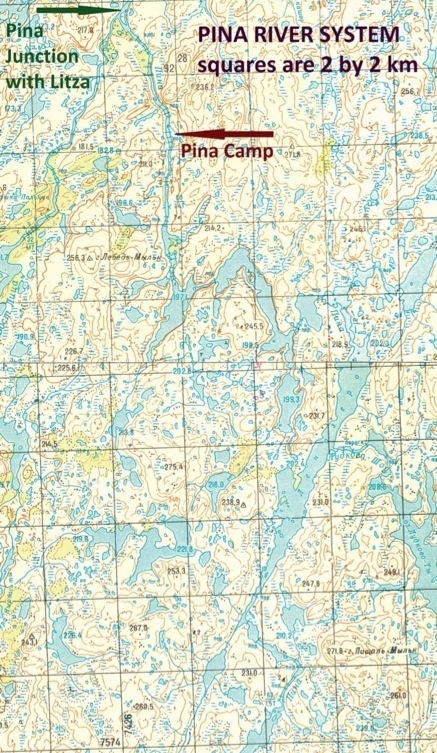 It would have been difficult as well to say where the real -hot spots- were as all the beats of the three mighty Northern Rivers produced consistently throughout. 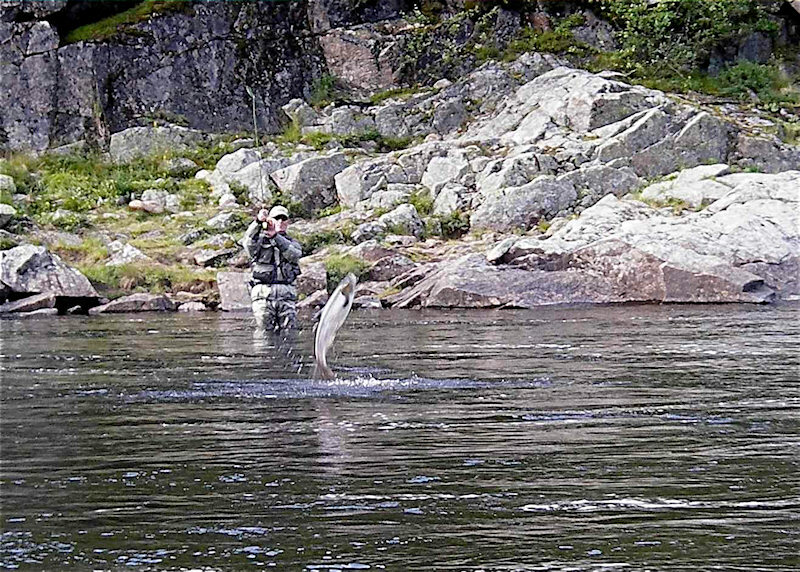 We must admit, it was certainly a treat to have the Upper Rynda River at our disposal again, as a mere three to four rods a day managed to locate some 49 salmon out of the numerous fishy pockets. 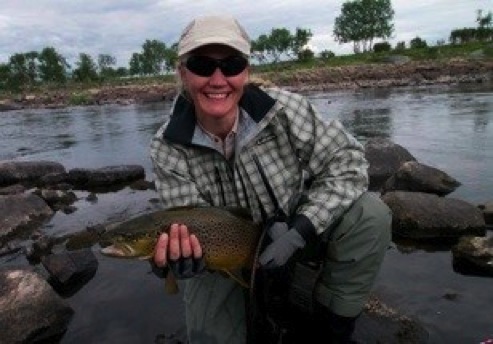 Elizabeth sure seemed to know what she was doing going on to entice eight Rynda beauties with her trusty Jeffer Dog fly including some cracking salmon of 15, 16 and 20 pounds. Or,how about South Park Kenny’s six up to 18 pounds that one rainy afternoon through the Five Pools. Although Richard showed his experience picking out four in a row from the Fan, it was our new Spanish friend Benja who found his big 28-pound P.B. with a few last cast out of the Eagles Nest. 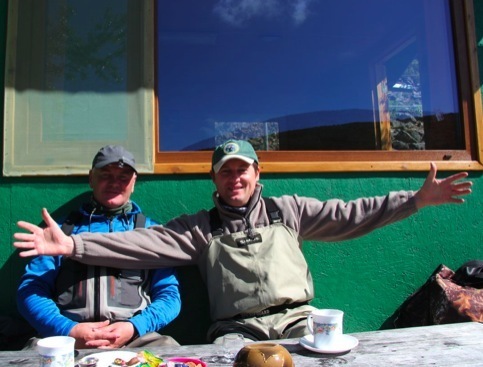 All the while, great things were happening here on the Kharlovka as well as Alan set the early pace coming home from the Kharlovka Falls with stories of his six salmon he landed that were all in the teens. 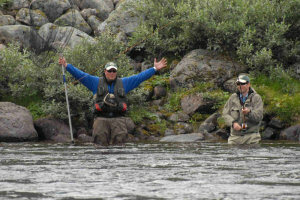 And then there was Phil and Paul who decided to wave off the helicopter and walk home finally arriving back late to dinner with eight up to 15 pounds to add to the fishing log. 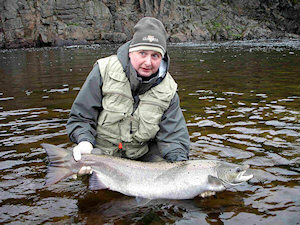 By the time it was all said and done – the mighty Kharlovka had given up 77 salmon on the week. As for the Litza, this river simply never ceases to amaze. 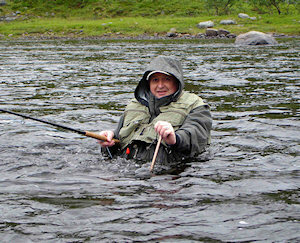 Starting out with Rob’s 25 minutes of glory on the Lower Tent pool before he unfortunately came unbuttoned from a massive salmon that was quite obvious to them all – well over 40 pounds! Noticeably shaken from the whole ordeal, Rob returned home that evening with that Litza gleam in his eye knowing that it was better to have loved and lost than to never have loved at all. 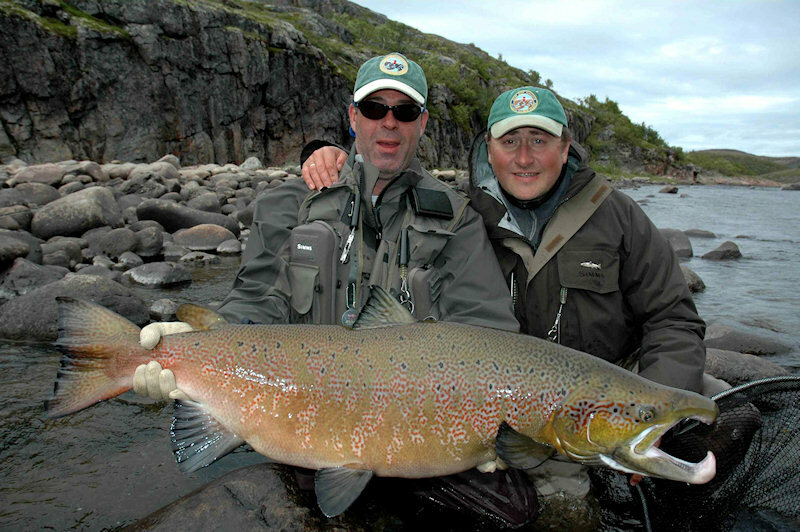 Two days later, it was Fernando storming back into the lodge with news of his 31-pound triumph out of the Dream pool – ‘Magnifico!’ And then there was our Viking friends Hordur and Orri, who simply could not stop fondling their flies – returning back from their Litza overnight with 10 tales including their three over 20 along with a brace of sixteen’s. 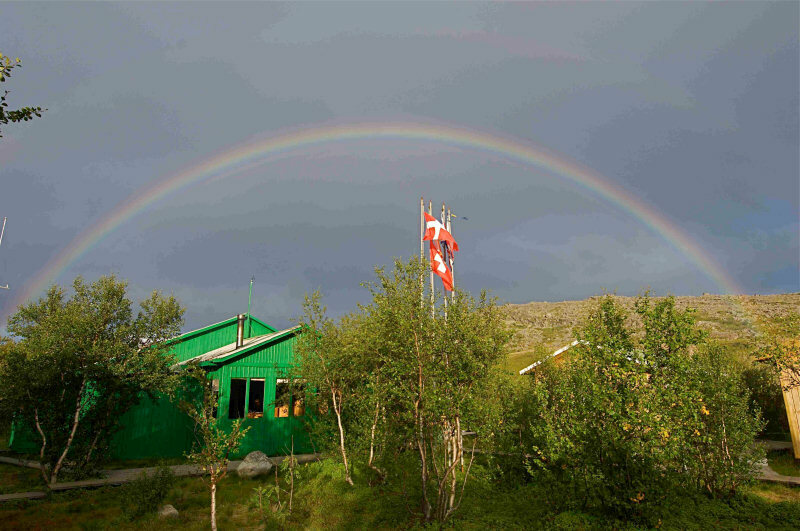 With warm temperatures of around 10 degrees C currently settling in over camp and our rivers finally starting to level out from last weeks spate – factoring in our remarkable record season – We are understandably optimistic about our precious few days left here on the tundra! 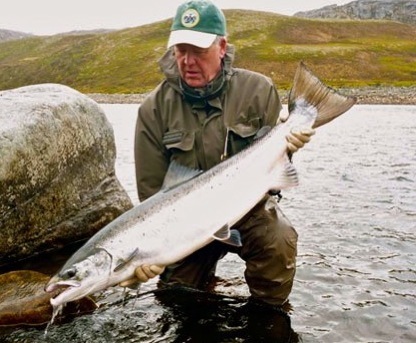 ASR rods have beaten the weekly five year average every week for the last eight so that the sum total of salmon landed is now an astonishing 45% up in this period. After an unusually late start to this season the catch results have been unprecedented so that it is a record season. 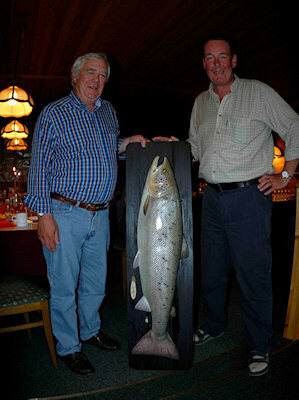 Recently we have had encounters with four 40lbs plus fish the largest measuring 123cms estimated at 46/47 lbs. 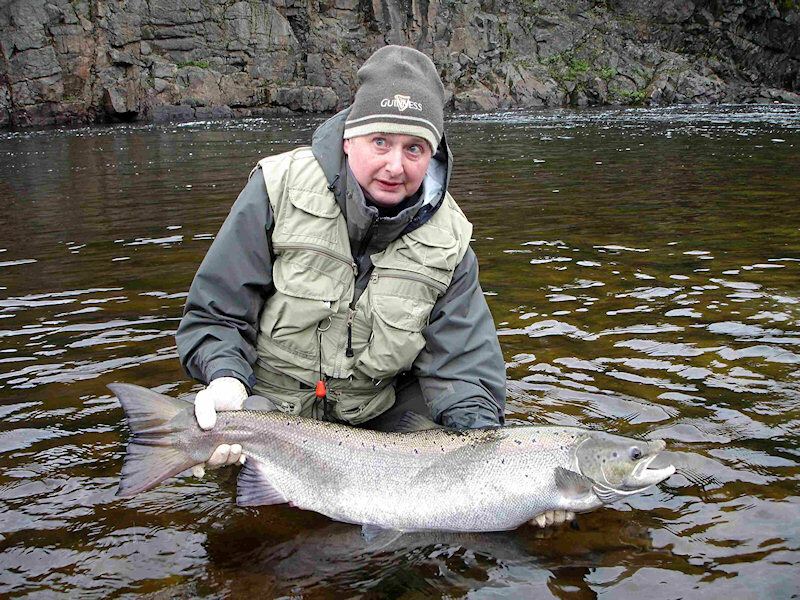 To top it all the first 18lbs sea liced -Osenka- was taken on 24th August at Island Pool on the Kharlovka to be followed by one of 19 lbs and another of 18lbs last week. I am sorry to be late with the invitations and prices for 2009 which should go out this week. It has been a hell of a struggle on the economic front so we have been devising some flexible Tundra Adventure Fishing Programs for the Late Summer & Autumn. The concept is a low helicopter content with walking between a network of tent camps & shelters and the lodges to make the ASR experience more affordable and exciting for the fit & agile and to encourage young people. The Kharlovka – Rynda Report: Week 35 Ending Friday, 29-Aug-08. Due foggy conditions our latest party of cheerful guests arrived late Saturday evening without enough light to properly start fishing. 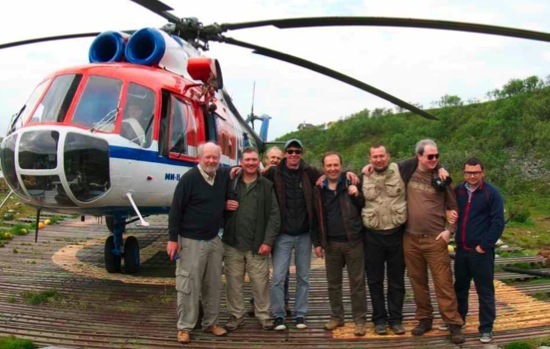 With one precious day now gone, Sunday morning we started up two of the helicopters simultaneously, fanning the rods out across the rested pools of the -Three Rivers- – Kharlovka, Litza & Rynda. 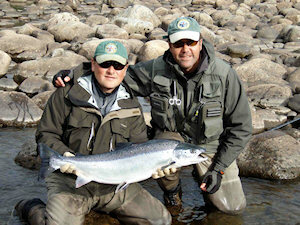 Fishing the majority of the week under dark misty sky – the weather was on our side. Although the final Friday might have been a bit damp, there was barely a breath of wind to complain about throughout. The air and water temperatures hovered nicely around the 10-degree mark, while our rivers slowly dropped one centimeter a day down to a current late season reading of 5cm on the Kharlovka home pool scale. Fishing hard everyday and staying up far too late, this lot was on record pace from the very word go! In fact, there was so much celebrating around here last week that we nearly had to call in an extra helicopter full of wine and spirits just to get us through. 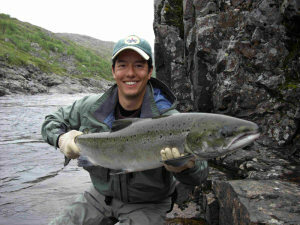 Seriously enjoying their three rivers experience, all our guests were able to find salmon from all -Three Rivers-. 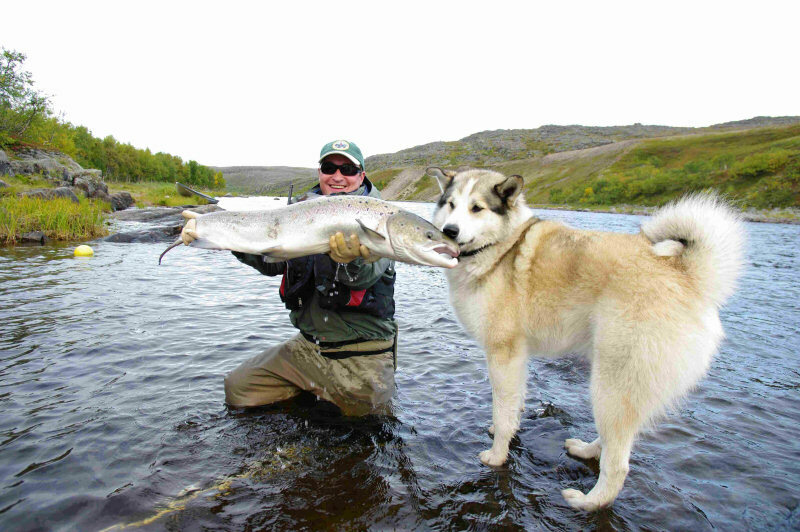 Rynda excitement included: Sasha in the MI-2 followed by beautiful autumn walks along their favorite pools as a mere four lucky anglers a day with a river to themselves – Claus and Steen pulling in those 5 salmon near the 3rd Waterfall including a 23-pounder – Peter and Diego’s escapades down through the Five Pools area, producing 8 salmon with the largest tipping Vasiliy’s scales to 25 pounds. 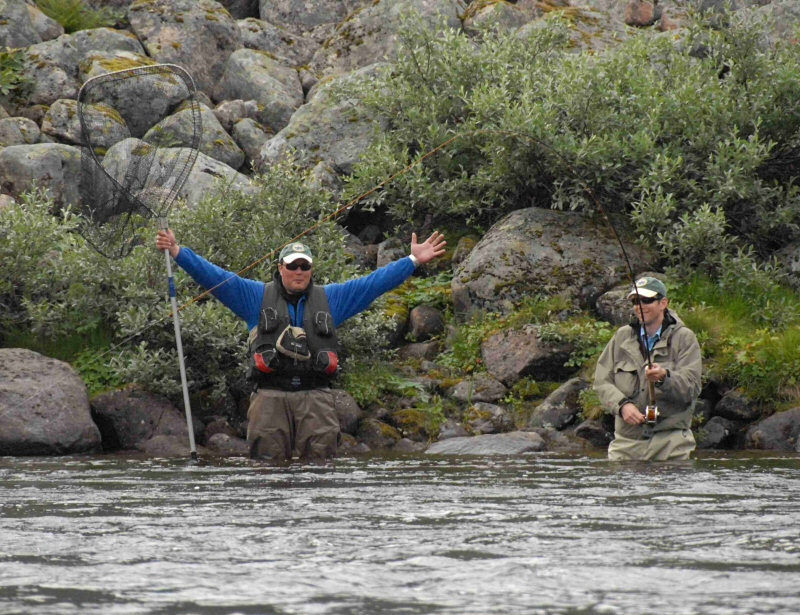 Thankfully sport seemed to be spread out nicely both between the three northern rivers and our cheerful friends. 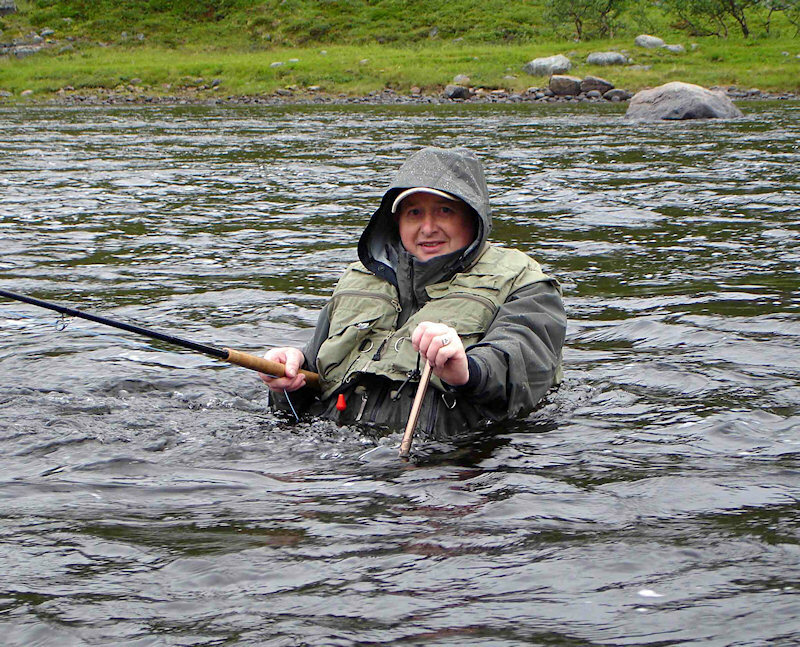 With nearly a third of the group asking to borrow rods – reels and waders, you know that there is surely going to be a few -personal bests- to follow. The most honorable Lord Hawkesbury broke his personal best three times finally topping out with a respectable 21-pounder. Reenacting the whole episode later back in the lodge, we finally had to restrain his Lordship from spey casting one of our dinning chairs out the window! There were many others that displayed similar excitement for after the smoke had cleared and it was all said and done, there was a joyful 10 P.B.’s that had fallen on the week! 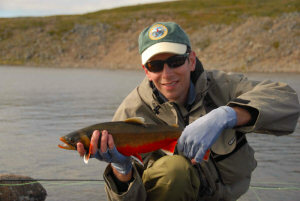 A most honorable mention must also go out to Capitan Eddie and his band of fishing addicts. Above all their new P.B.’s and late night mischief, in the end it was brother D-Arcy who stole the show. Opting to stay over with his mates on the tent camp, Big D-Arcy returned home completed -Litzed- after battling his 5 salmon in the double figures including the 19, 23, and mind-boggling 33-pounder which they chased for an hour and 55 minutes all the way down to the Red Cliff. There were so many toasts that night that, despite Camp Rule No.1, we had to delay the helicopter by a full 15 minutes the next morning. 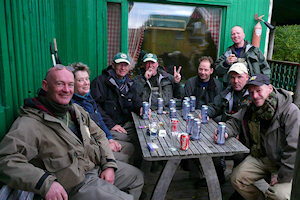 After all the stories had been told and the last bottle of wine was drunk, this group of hard charging young lads managed to break our previous record with 163 fish. The Kharlovka – Rynda Report: Week 34 Ending Friday, 22-Aug-08. 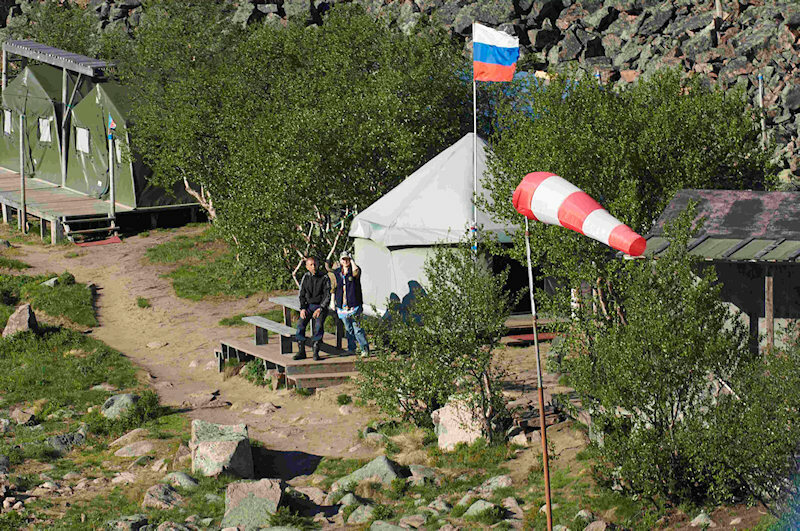 This week I will resume the Kharlovka Report and you will find Rynda under the last Rynda report of the season under -Life at Rynda. Apart from a couple of windy days the weather has been good but the latest team inherited the lingering spate conditions from last week. The river has been flowing unseasonable warm at 13.6C, finally peaked on the Sunday evening at a mark of 23cm on the home pool scale. Slowly dropping 2cm a day, it wasn-t until the Thursday morning that our river temps finally started to equal out with the air. While Sunday may be considered a day of rest along some salmon rivers of the world, that was not the case last week on the Lower Litza. 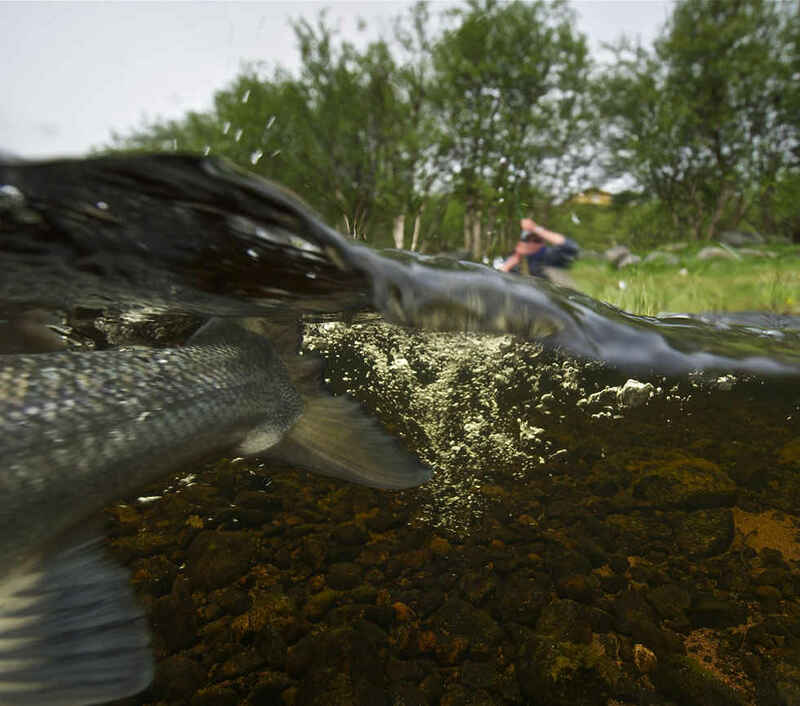 Around midday, Geir was stepping along the stones of the reindeer rapids when he spotted a massive salmon showing far out into the pockets. For the next two hours Geir, along with Big Alex, proceeded to go through the fly box. 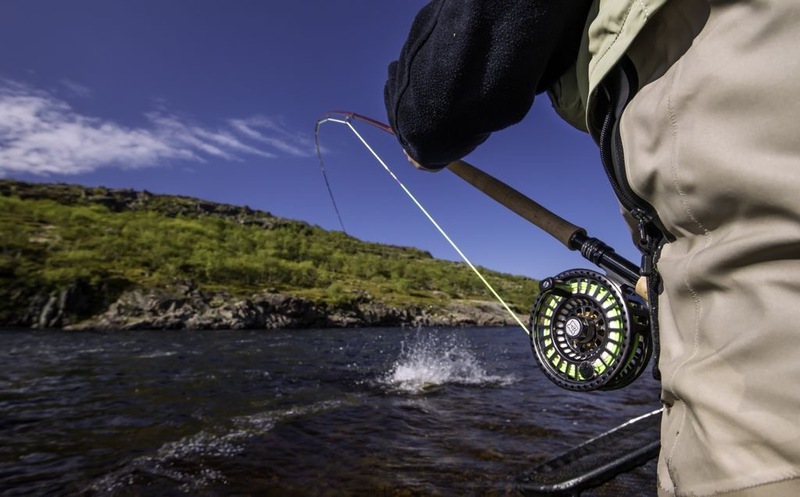 After carefully presenting one of nearly everything they could think of, they tried my favourite fly – The Laerdal Sunray Shadow.For the next 45 minutes, Geir cranked away on his reel while Alex forged through the strong currents, rescuing the line various times from the boulders. 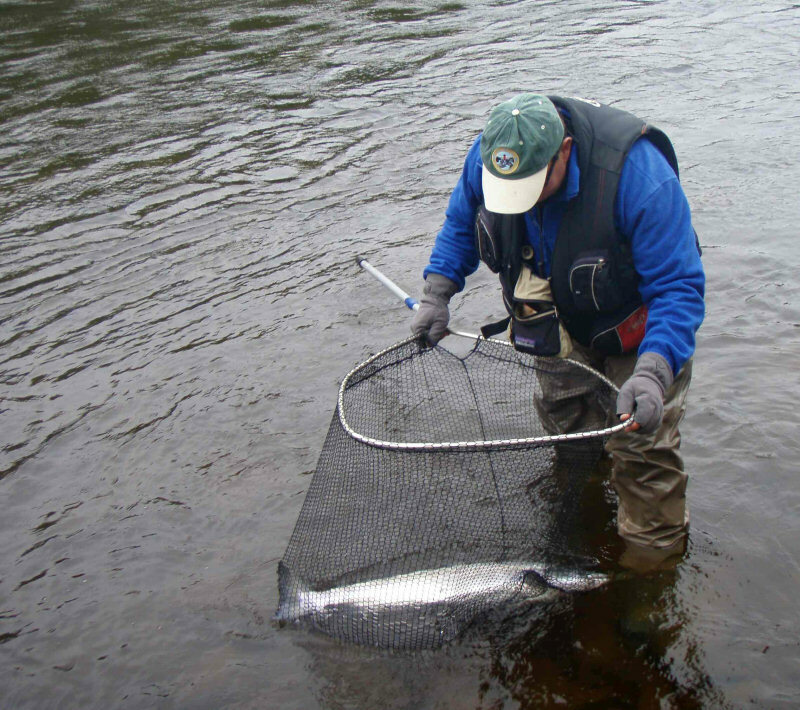 Miraculously, nearly one hour later (with his video tape now completely full) his great salmon somehow managed to make it to the net. 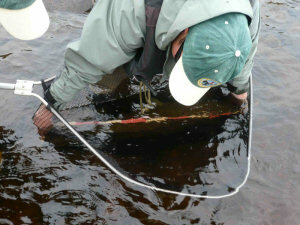 Stretching the tape to 119 X 65cm = 41 pounds! 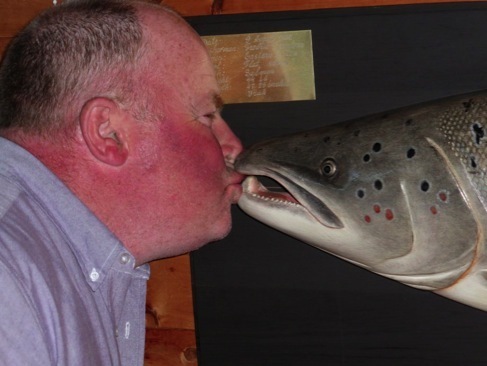 Inspired by the Norwegians tremendous achievement, Steven found himself in the same delightful situation the next day. It was reported that after watching his 40+ pounder take the fly from high above the rocks up at the Kharlovka Falls, it shot the rapids heading straight down for the Guys pool. 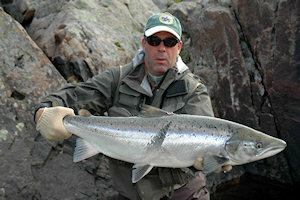 As his giant salmon came charging into Guy’s another great fish was disturbed. 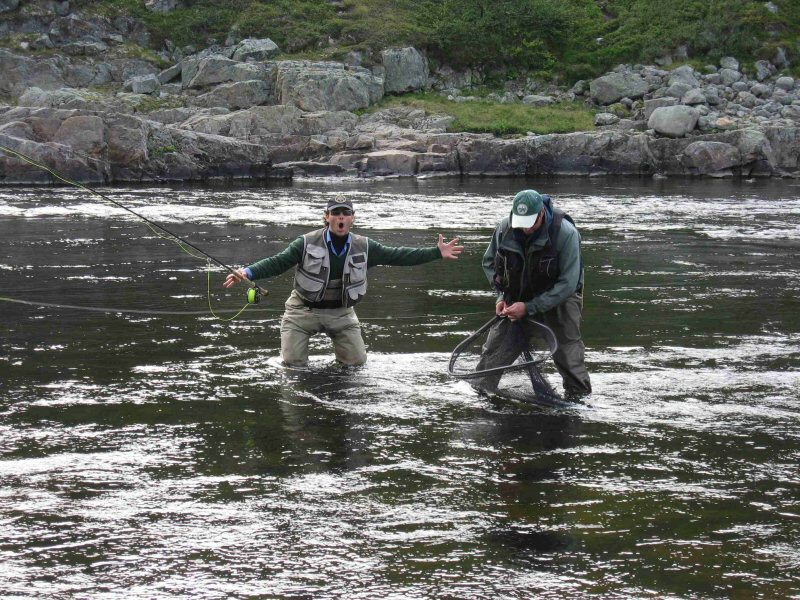 All of a sudden his joy quickly turned to panic as they could see that the fish was twisted, rolling over the line. Unfortunately, only meters away from the net the fly slipped loose, leaving them all with a burning memory that will never be forgotten! 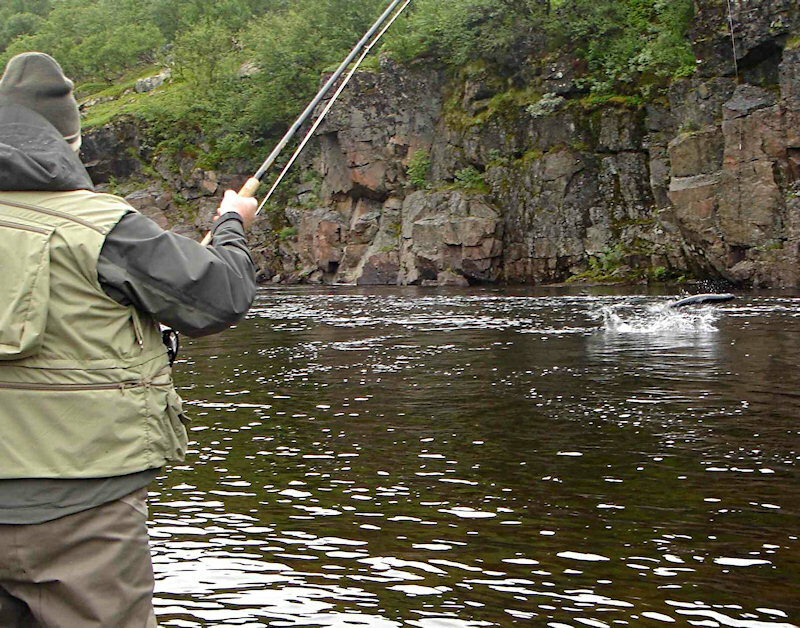 A lot of big fish were lost last week but there were plenty of moments to shout. 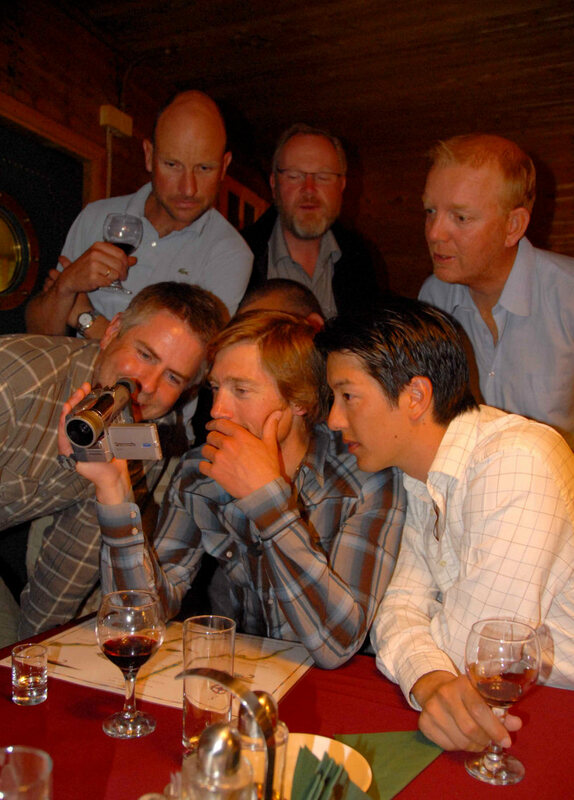 Take that perfect Thursday for example, when everyone returned smiling back to the lodge with their digital cameras in hand. 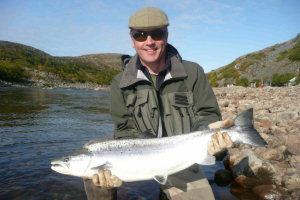 Five of the seven pairs were delighted with big fish that day with 21, 21, 22, 26, 29 pounders. Then unfortunately on our final day, while the team was certainly all tuned up and ready to finish strong, the dreaded fog ended up grounding us close to home. 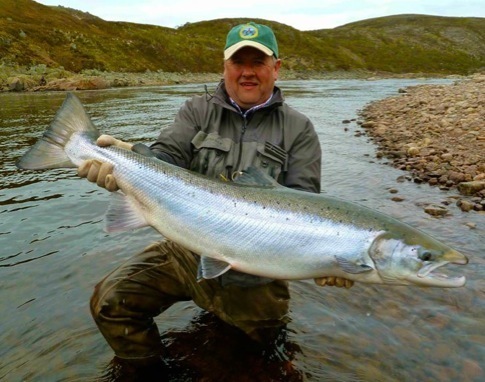 Nevertheless, all will be hoping to improve on their most respectable 134 salmon catch which is yet another record for the Kharlovka books. 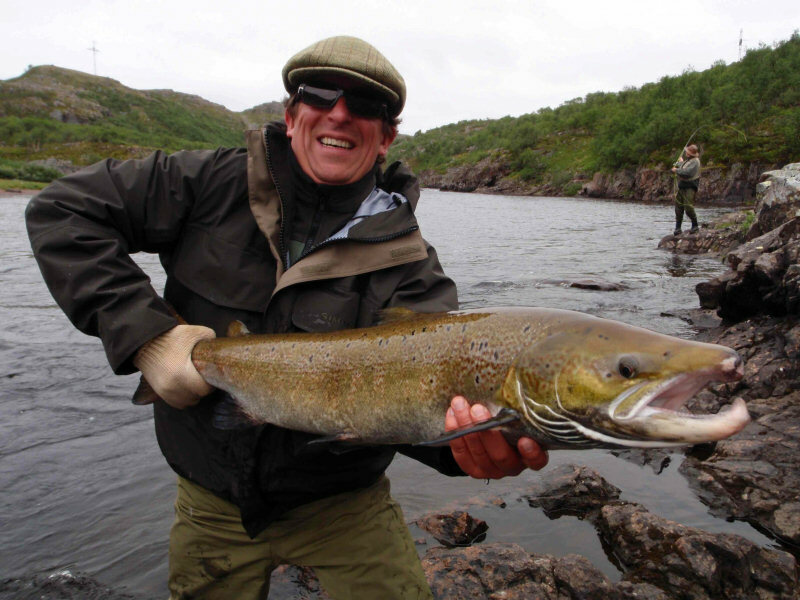 There were 6 personal bests and all of this was accomplished despite a wild brown trout detour to land 50 fish of 1Kilos plus and about 20 beautiful char. All of the rods proved to be true fishermen, they relished every precious minute of the day (and night) as if it were their last. My congratulations to you all! 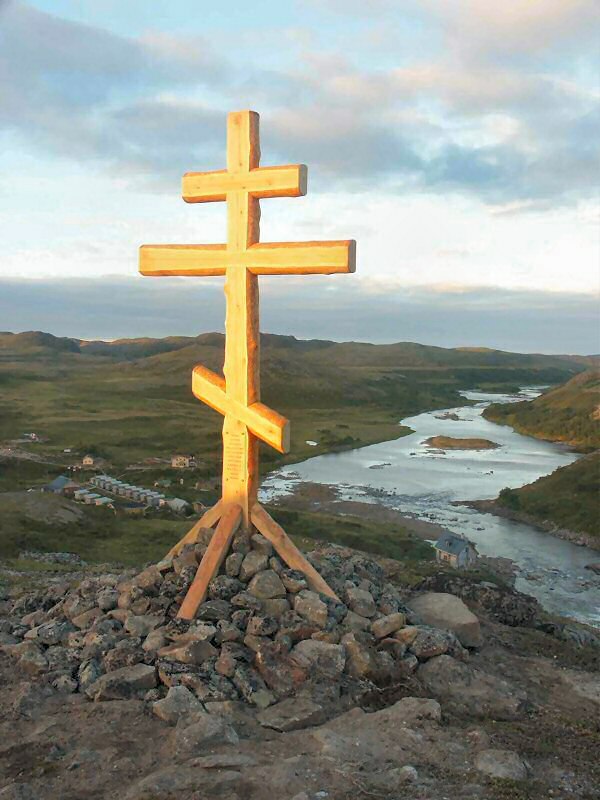 The Kharlovka – Rynda Report: Week 33 Ending Friday, 15-Aug-08. The Russian immigration authorities have determined quite correctly that business visas (as opposed to tourist visas) are not valid in the -restricted zone-. Unfortunately this means your two regular scribes have to reside outside the main camps but within the ASR. 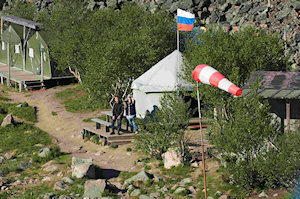 This is a temporary problem and our relationship with the Murmansk Government is excellent. However it falls to -Yours Truly- to step into the breach in the hope that you will accept less than the usual standard of reporting without complaint or query. Last Saturday our guests arrived into the camps just as the fog and mist began to settle down to the extent the pilot decided there would be no further flying that day. 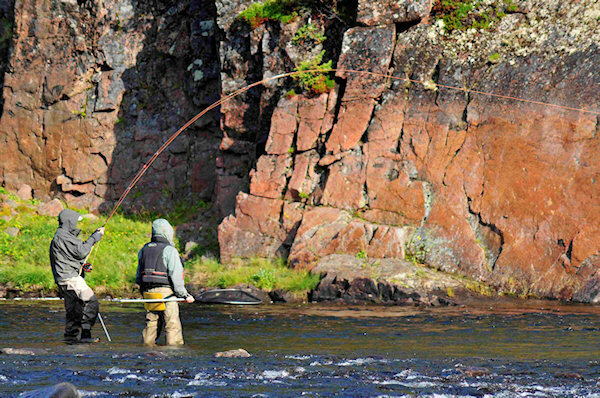 Without hesitation our intrepid younger rods marched off towards the very top and bottom beats. Our charming Swede friends filled in through the middle, leaving the odd Dane and a few Englishman to roam about close to home. 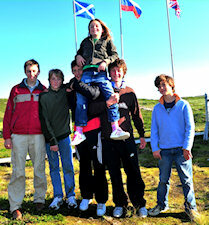 Two and a half hours later they all staggered back into camp soaked yet far from beaten. Sunday was much the same character-building scenario for the Kharlovka rods – with no flights again to Litza. While across at Rynda, despite similar challenging conditions, everyone was successfully deployed to their beats resulting in a solid start for their week. We were then surprised by two warm sunny days so that all the rivers shot back up into the mid teens ending in torrential rain through the night raising the height of the rivers. With the barometer bouncing up and down through the week the winds proceeded to pick up to nearly un-fishable speeds – gusting to 80kms an hour. 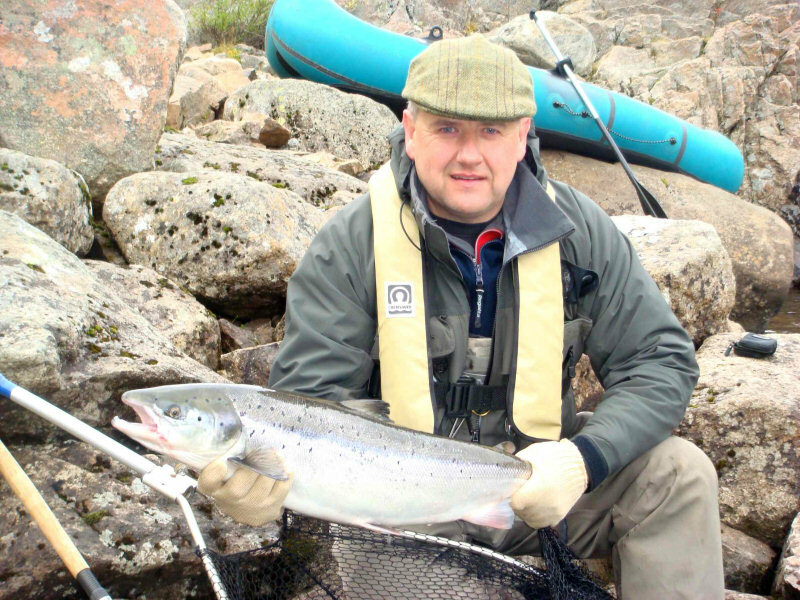 The howling gale force whipped up the pools – clouding most of the river with algae washed in from shallow pool margins, rendering the fishing very testing indeed. 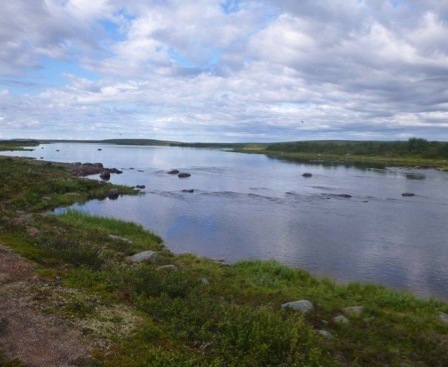 Meanwhile our off-coloured rivers were once again on the rise – up 12cm at Kharlovka and about 6cm at Rynda. In short neither camp was really given a fair chance. 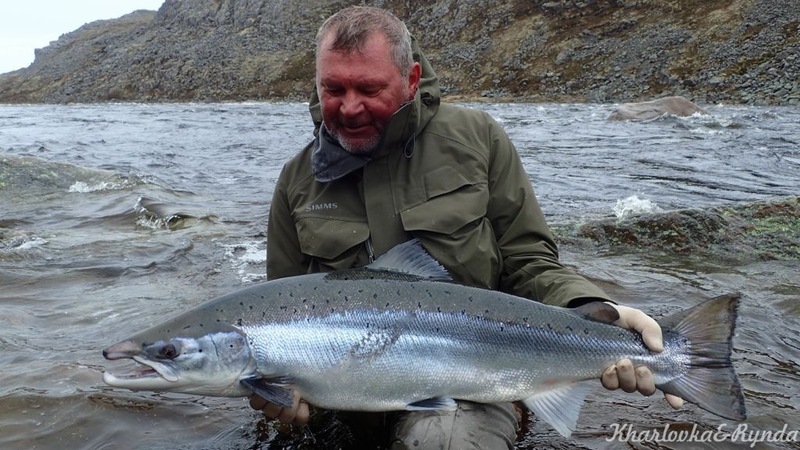 Although both the Rynda and Kharlovka have been on a serious roll lately – landing over 400 salmon for four consecutive weeks in a row, the reality is that not every week can be a record. 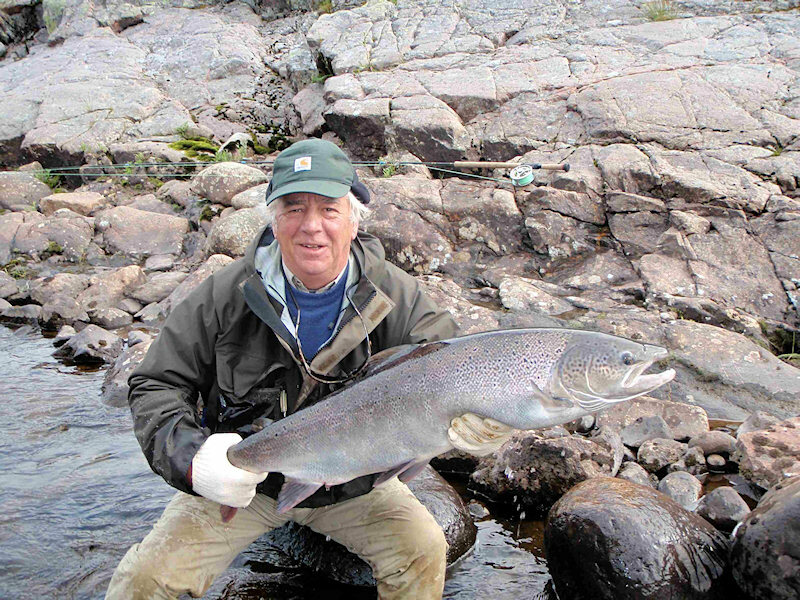 Despite the appalling conditions the Kharlovka catch was 111, the Rynda catch was 122 and the combined ASR total of 233 was well over the five year average and not that far short of another record week. 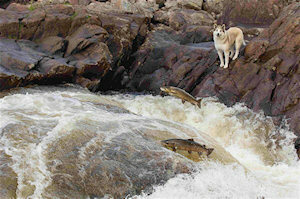 It should also be noted that nearly as many salmon were lost as many of them simply kept parting company. Hopefully, next the water will drop, the algae will clear and things will be back on course for a record season. 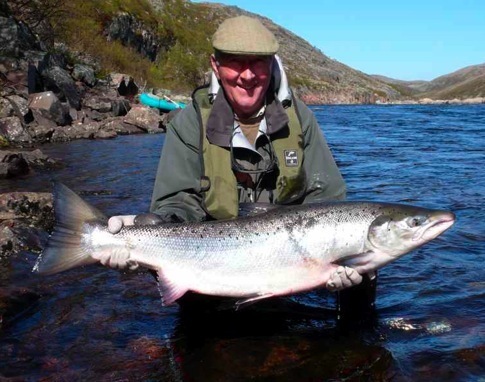 We have been a bit short on MSW3 salmon this season which is much to do with high water but we should see a few more crocodiles landed as the rivers lower and the water temperature drops. 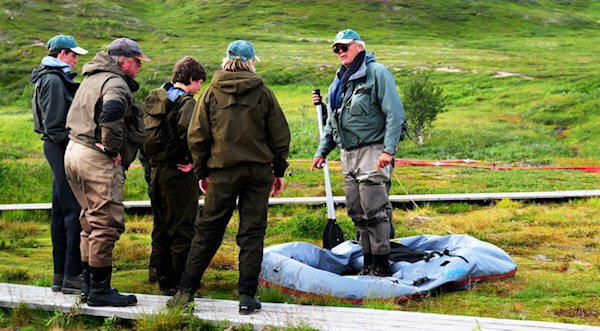 It is wonderful how the combined experience of guest and guides has learnt gets the best from the ASR’s rivers in all conditions. Rynda was an ASR Youth Program week with Hugh Daunt 11 years of age with best fish 12 lbs, Hannah Sharp 12 with a 14 lbs, Joe Ranson 13 with a 16 lbs, James Sharp 14 with a 14 lbs, Brynmoor Ferris 16 and William Morley 16 all with admiring mothers and fathers fishing alongside and accompanied by the -twins fishers- Jonathen & Duncan who took a 22lbs bright fresh salmon in Zolotaya Lower rapids and by some miracle landed it in Long Pool 2M higher up river 200M away. His explanation for this remarkable feat was: -I didn-t want loose it down the rapid like last year.- The spot is now called -Duncans Rush-. It was a week of pure delight and happiness never to be forgotten. 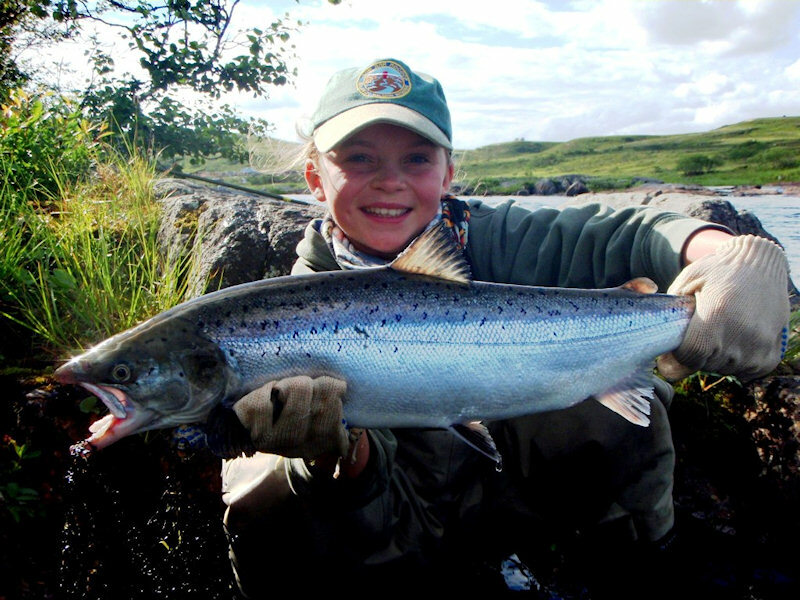 Although all of them had their fishy tales to tell, it was little Hannah, who despite only being 12 years of age, fished like her life depended on it, going on to inspire the entire team with her bright smile up to the very last cast. We will be sending out the invitations from the UK for next season in the near future. We have suffered horrendous cost increases this last year and 2009 will not be much better. The Russian management is currently struggling to figure out the best that can done for us all. 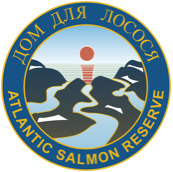 My current project is to ensure the future of the Atlantic Salmon Reserve for international sports fishing and environmental protection in perpetuity. It is 11 seasons now and just as exciting as it always has been. The Kharlovka Report: Week 32 Ending Friday, 8-Aug-08. Last Saturday, they all wasted no time gathering into our exclusive VIP zone at the Murmansk airport with one Big question on their minds – Are we still in time for this so called summer bonanza you’ve been having around here lately- After persuading them all to spread out and relax, they could see by the bags under our eyes and the line burns across our hands that we were quite obviously still – smack dab in the middle of things. In between cheers and suspicion they proceeded to pound down the beers like this would be our last stop of the week; fortunately, we soon got the word from the tower and were off again on our merry ways. Crazy things have been happening around here lately. From our recent solar eclipse that suddenly brought on the salmon, to that mythical severe weather warning, which was calling for three to eight centimetres of snow that we somehow managed to dodge over the weekend, to this seemingly endless run of silver summer salmon – there never seems to be a dull moment around here. While this is not the first time that we have been led on by the forecasts and it certainly won’t be the last, it remains pleasantly impossible to predict what could possibly happen next. 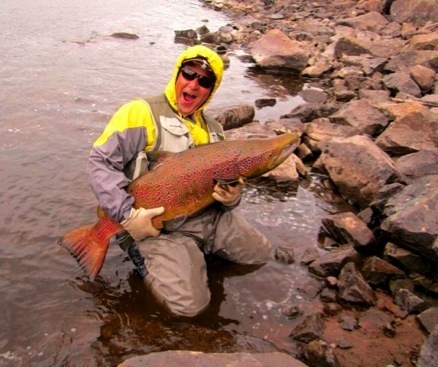 After surviving a few previous seasons of hot tricky conditions, our good friends finally had their salmon dreams come true! The winds basically died as they landed in camp. The temperatures proceeded to lift up into the low teens. Our rivers were clearing, finally starting to slowly drop away. Dark low clouds rolled back over our Arctic coast, where they would thankfully remain for the majority of the week. Except for that small blast of sun towards the end, just to give them all a bit of color for the road, it was one of the fishy weeks of weather that we can recall for some time and for once, there will be no need to go on about it any further! One optimistically gray day up at the Kharlovka Falls, Sam the Butcher staggered his way over to the edge for a few flicks off the rocks. 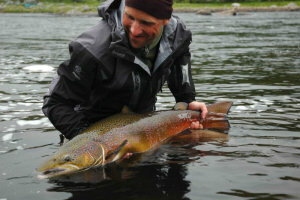 Wisely choosing to go with his deadly double-beaded stonefly nymph, it wasn’t long until he was hooked up to greatness. Yes that’s right – Down the rapids it went, totally out of control. Getting a bit worried that he may never see the thing again, Sam began to give his moment some ‘extra stick’. 75-meters into his backing and snap went the line! Fortunately, Sam happened to be fishing with a master who had seen it all – so many times before. 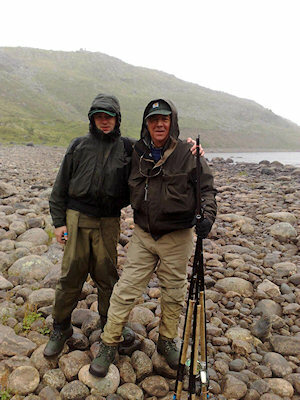 Led on by his veteran guide Kola, they moseyed along the trail to the lonely birch tree, half way down the run. Kola told Sam to have a seat and enjoy his hot coffee, while he rigged up the single-hander. Winking he proclaimed, ‘I’ll be right back.’ 42 minutes after losing the lot, Kola proudly marched back out of the run holding onto some bright orange line. Down through the guides and into a firm knot, Sam stood up again and began to regain control. Having rested for nearly an hour, they both pulled hard not to lose the battle. Finally – Sam was able to see the silver light. With a last great heave, his bright 20-pounder eventually lost out to the net. Shocked, and ever so pleased with this season’s tale for the boys in the pub back home, our good friend Sam the Butcher has obviously learned to – Never stop believing! And how could we possibly ever forget about good ol’ Fast Eddie, along with Alan and their big bag of tricks, who simply left all their kit behind with Big Alex from the last time they were here – only two weeks ago. 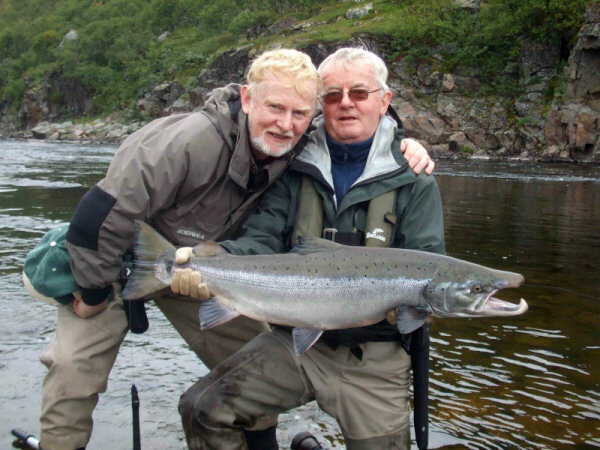 This time around Eddie decided to bring his son James to show him what the Big silver fuss was really all about. Monday morning, all fresh and raring to go, they marched single-file down to the Military pool and cast their tubes upon the water. It didn’t take too long before Fast Eddie was off to the Litza races. Not our biggest fan of these Olympic sprints down across the rugged rocks, he ground his heels in and gave her all he had. For 15 delightful minutes his angry salmon darted about the pool. Eventually, Big Alex was able to put an end to the madness with one mighty scoop of the net. Slightly worried that he might now have to order up another one of those wood carved salmon, after just taking a previous one of 32-pounds home earlier this year, Alex lifted his latest triumph high with the scales and said, ‘Don’t worry Eddie, it is just another 30-pounder!’ Quite pleased with himself, Eddie cast straight back in. 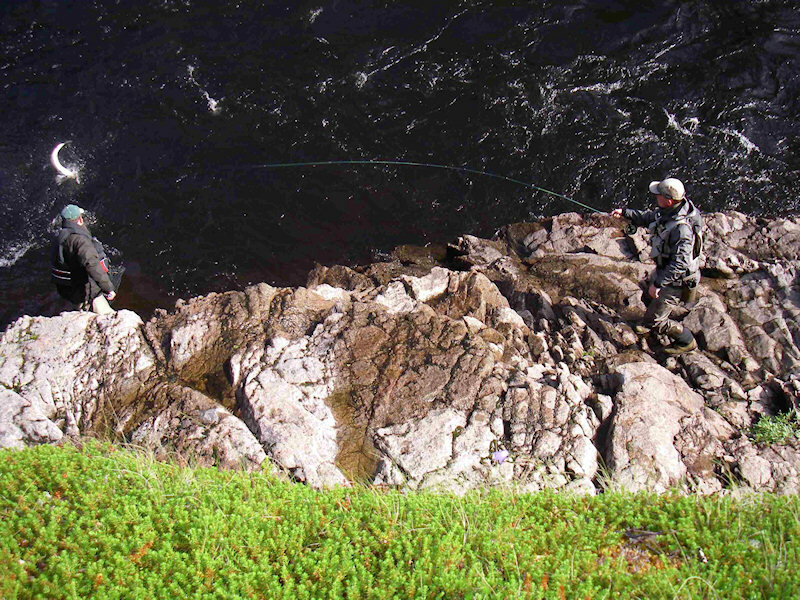 Within moments, he was hooked up with an even bigger problem, which forcefully took off straight up the heavy stream! Circling the pool several times, they were all able to get a good look. In the end, the fly gave loose as his estimated 35-pound dream fish porpoised her way to freedom across and out of the pool. Don’t feel too sorry for ol’ Eddie, for two days later, his son James ended up stealing the show with a new family P.B. of 34 pounds. This last great moment may end up costing the family dearly, for James is young and could very well be hooked square in the scissors for life! 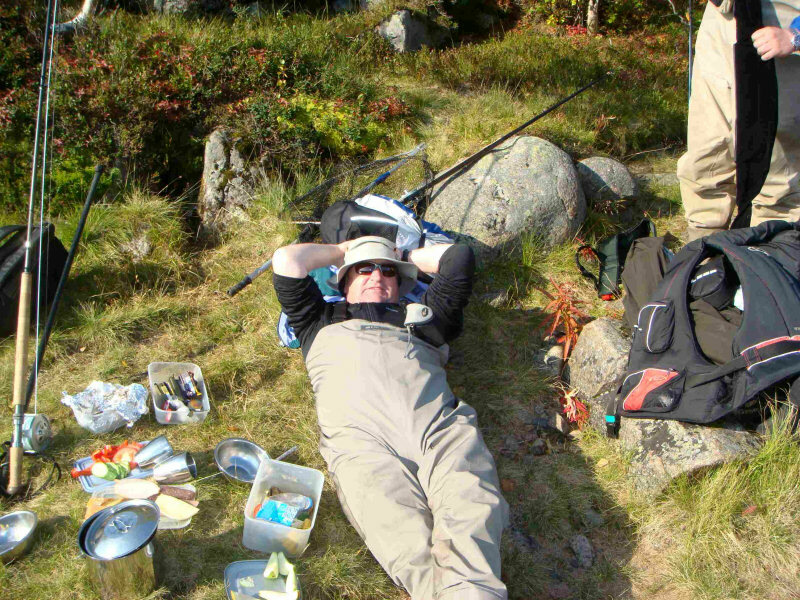 Middle of the week around lunchtime, the guide’s radios began to crackle along the river. 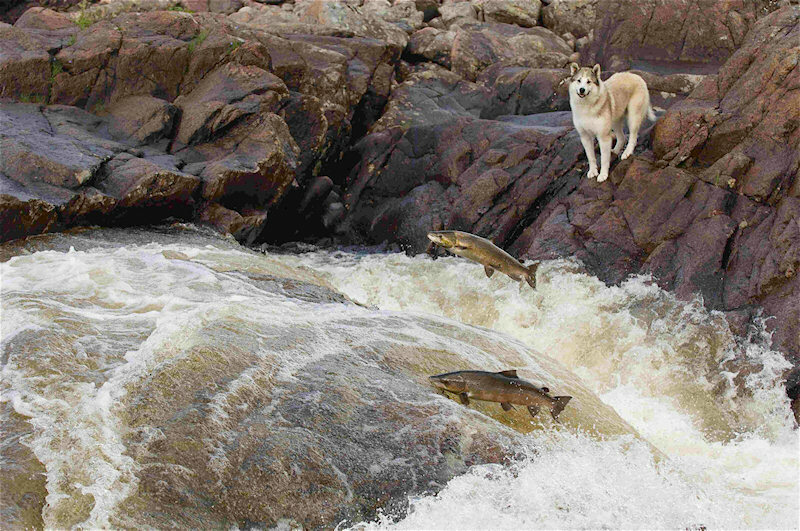 Up and down the Kharlovka and shortly thereafter, all the way over to the Rynda, we sat glued to the Big fish situation that was unfolding up at the Falls. 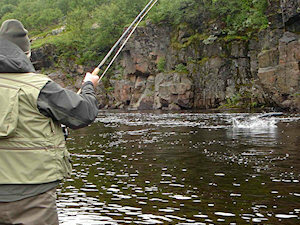 Russian slang was translated, play-by-play to the listening guests – ‘One hour and 30 minutes now and we still haven’t seen the fish!’ Staying low along the bottom, it simply wouldn’t budge. 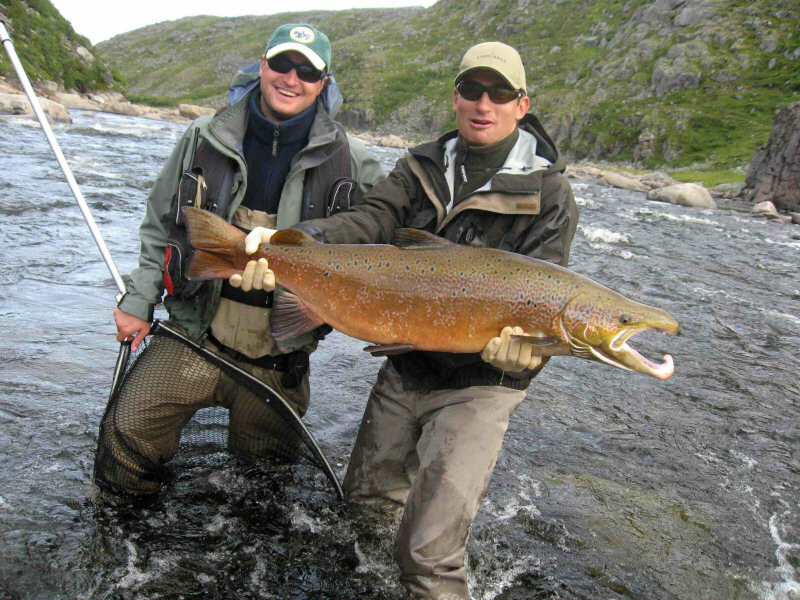 The big salmon drama played on for another 41 minutes before Sasha (or Fransusk – the Frenchman, going by his walkie-talkie nickname) proudly signed off with the most entertaining news that Richard’s 32-pound crocodile was safely in the net! And with this, the radios again went silent. Highlights around here lately have been Big and plentiful. Along with the three fishy tales of those exciting 30+ers, there was another six of the lads that released 20+ pound beauties of their own. There was also this one quite young man named Thomas, who managed to tease 5 consecutive salmon in a row out of the Flat Stone including those back-to-back honest 19-pounders – All, by the way, on his single handed rod! 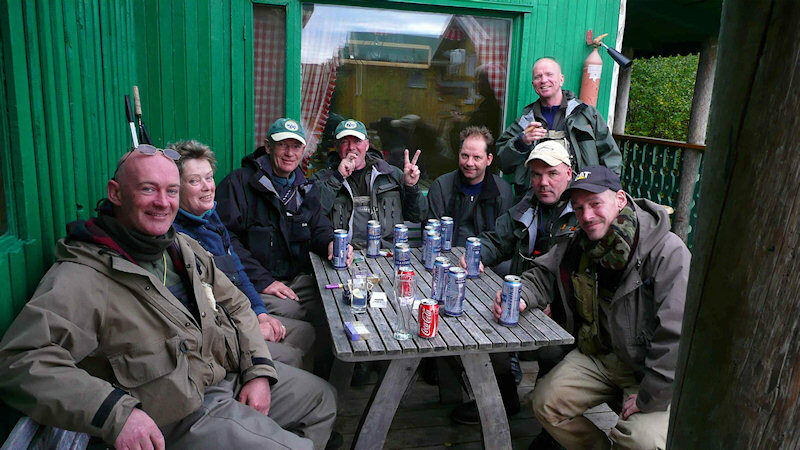 Skillfully serving up flies like the Eternal Optimist – Massive Red Franchisees – classy Silver Doctors – Irish Pot Belly Pigs – and those crazy Danish Jerk Flies, it was not surprising that this group of fishing bandits were able to pull some 207 salmon out of the big silver pot! We seem to be having another one of those normal seasons of completely unpredictable situations up here. From our distant late spring, to those precious few days of summer, to the early arrival of fall, it would be impossible to predict what might possibly happen next. Come to think of it, we wouldn’t be all that surprised if a huge Osenka came blasting in right now. 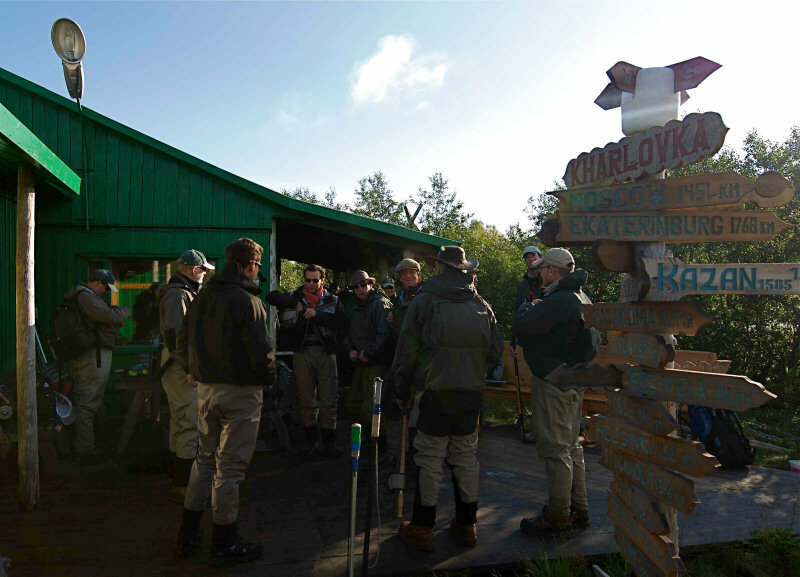 We are starting to get a bit worried though, for at the record pace we’re going, we will surely run out of pages in the Kharlovka fishing log – within the next 10 days! 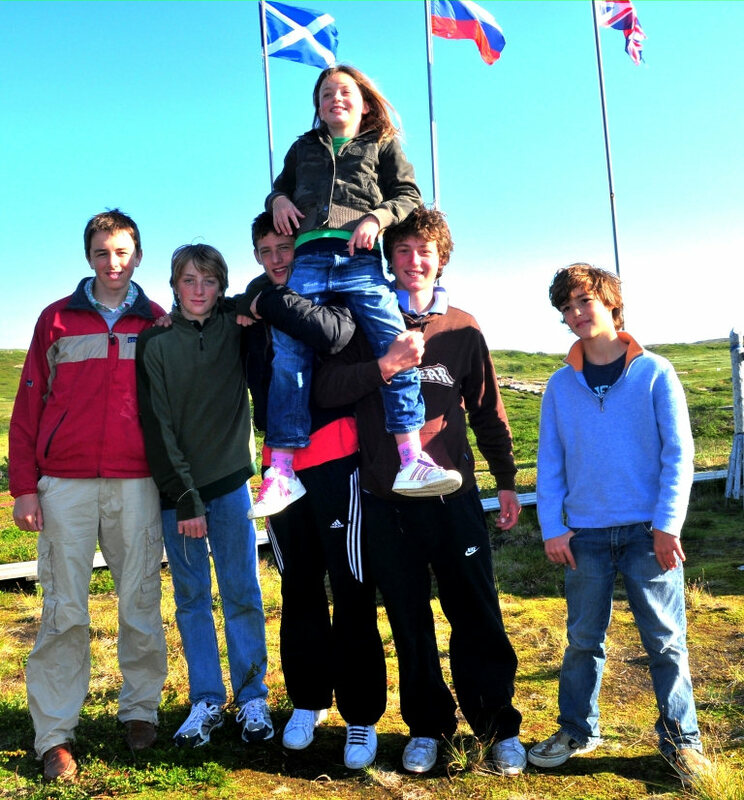 This weekend Peter returned from a short visit to the UK to entertain and hold discussions with dignatories of the Murmansk Region. At Kharlovka House with Governor Yuri Alexeevich Evdokimov and at Rynda House with Vadim Vissarionovich Sokolov, Head of the Fishing Department and Marina Vasilievna Kovtun, Head of Tourism. 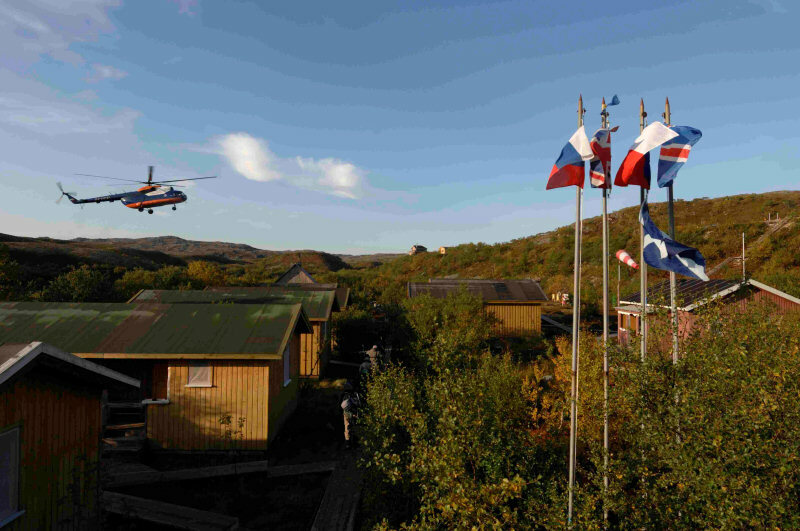 On his return to Murmansk the Governor was pleased to make a brief visit to inspect Rynda Camp following the completion of the new en suite guest cabins, making his departure from the Rynda Cross. Over last the four weeks ASR rods have been catching fish in extraordinary numbers on all the rivers substantially beating all records since 1992. 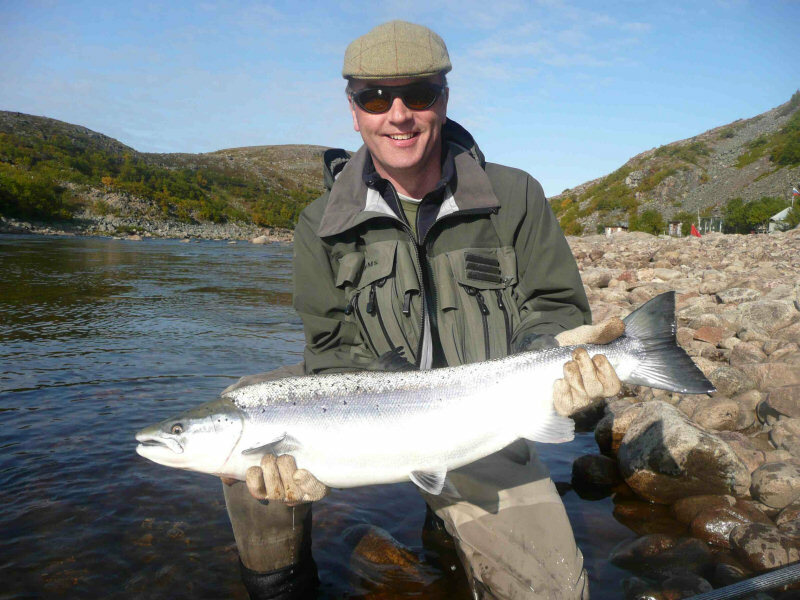 Whilst the first half season’s catch has been below average the second half has taken us into numbers we could not have imagined, with an astonishing percentage of fresh fish and a surprising number in the 25-35lbs range. 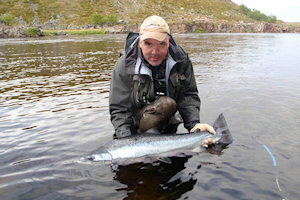 In total these extraordinary weeks have produced one third more salmon than the five year average. It has been the latest season on record and the rivers remain above their seasonal norm. This bodes well for the remaining weeks and suggests we are heading for a record year.